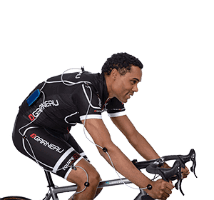 MotionFit uses Retul 3D motion sensor to simultaneously gather data on multiple angles of the rider. The Retul system is accurate to within less than a millimeter, creating true objective data which can be utilized by our master fitter for the perfect biomechanical fit. 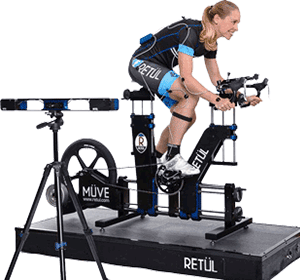 RETUL (EXISTING BIKE) *If you already own a bike and are looking to achieve the best position then, this is the best service for you. RETUL (NEW BIKE) *If you are you looking to purchase a new bike or custom frame, then this is the best way to ensure the perfect fit for performance. Excellent personalized service. Looking forward to the changes and positive results !!! Not only is Coach Kameel one of only 17 Retul Master Certified Bike Fitters in the entire nation, Coach Kameel is here in Central Florida. 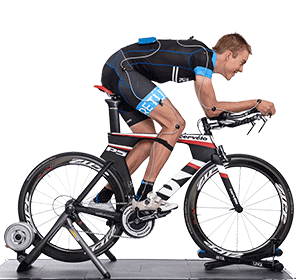 A professional bike fit is the best investment you'll make on your bike. It doesn't matter what your skill level is, everyone would benefit from a proper fit. got my bicycle fit done with Kameel and MotionFit and I couldn't be any happier with the results! His professionalism and knowledge delivered the highest quality in the industry , I felt great on the bike! Thanks Coach Kameel Abdurrahman for the bike fit! . Amazing how much different and better the bike fits me. If you haven't had a custom fit for your bike yet, get it done! Your power, efficiency and overall performance will improve with the computerized Retul system that Coach Kameel uses. Coach Kameel is certified to fit pro cycling teams, so you know he will get you dialed in! Had the opportunity to fit my Cervelo P5 with a Retul fit by coach Kameel. Had a little issue with the bike before the fit, but, after I'm able to keep a faster speed for a longer period of time without any discomfort. Riding any bike without a fit is insane... Get fit and keep ridding! I was having a lot of pain in my shoulders and neck riding my tri bike. I thought I should just tough it out. I read a lot about proper bike fit. I researched several fitters and chose Coach Kameel after I spoke with him. I am so glad I did! He was very professional and very precise with my bike fitting. I feel so much better riding my bike. I can ride in the aero position so much longer. I was also fit with a much more comfortable saddle. Get a professional bike fit you won't be sorry! After upgrading to a higher end tri-bike specifically an Argon18 E-118, I needed to maximize my potential of being a triathlete so a professional fit was necessary. Seeing all the positive feedbacks for Coach Kameel, I decided to take advantage of his expertise, Retul. Kameel is the man and I am so thankful for the introduction to him! I had a Retul fit by another bike fitter in the past and Kameel is in another league. My fit is perfect; I feel completely balanced and comfortable to hang out in the aero position for long periods of time even with the watts high. Kameel understands the tri fit VERY well, which most do not. I cannot endorse Kameel any higher and will recommend anyone I know to only use Kameel! I'm a 6 time Ironman finisher and Boston Marathoner. I had my first fit with Coach Kameel a few weeks ago, and I immediately felt a difference in my power and comfort. The fit was detailed and I was able to mimic my new position at home on my cyclops trainer. Thanks again Kameel; best fit in years! I got involved in the world of road cycling a little less than a year ago. I always just thought you had to buy the right kind of bike and let your body adapt to it. I had never heard of a "bike fit". I had no idea how extremely VITAL it was for me to get my bike adjusted to help me achieve my cycling goals and to fit my body geometry. Having spent a lot of money with other so-called experts in fitting with stupid results, finally Kameel got me in a comfortable position where I'm producing more power with each pedal stroke. I now even get comments about how graceful I look on the bike now. Some can say that fitting is expensive but so is buying the wrong size bike. A fantastic experience I cannot recommend highly enough. Coach Kameel: I want to thank you for the Retul bike fitting that we made prior to my first 1/2 ironman. I was having problems getting comfortable in the aero position prior to the fitting. I realized that a 56 mile bike ride was not the optimal choice following a bike fitting. The fitting allowed me increase my aero riding to excede 2/3 of the event and deliver my targeted time on the bike segment. I followed ride with a very respectable 1/2 marathon for me. I had a Dartfish fitting recently with Coach Kameel. Before the bike fit i was experiencing pain & discomfort to areas I shouldn't have any. I even looked uncomfortable on the very detailed video that was taken.After the fit I have been on long rides without any problems adapting to the changes and no pain!Coach Kameel was precise,professional and very honest about his recommendations for my future goals as an athlete. The experience was more than just a "fit".Thank You! Coach Kameel was very thorough . He took the time to fit me on both my bikes And found several adjustments that would help with my speed and comfort. He also made recommendations for seat brands handlebars etc that would be appropriate for my fit. Very profession and helpful. Coach Kameel was extremely thorough, detail-oriented, and expressive in his analysis of my bike fitting. The motion-tracking software will amaze you. Some shoulder pain was even alleviated by a more appropriate adjustment to my stem and seat height. I would not hesitate to recommend a friend to his services and in fact I was referred myself. I had Coach Kameel fit me with my new aerobars. After initial muscle adjustments getting used to the new riding position, I'm riding longer, a little faster and with a lower overall heart rate for the duration of the ride, which will definitely help me conserve energy for the run during my tri's! Thanks Coach Kameel! All I know is that before Kameel fit me I was always in pain in my neck and lower back. Now I am pain free. He is also one of the most professional people I have worked with. I also believe everybody needs to get in contact with him for a fit it is worth every minute he is with you. I was extremely impressed with Coach Kameel! I am now confident that I have a custom professionally fitted bike and can now focus on training only! No more advice from other riders and no more doubts about my fit. Am I sitting too high or too low? Is my handlebar too high and too long? From now on it's "Hammer Time"! Thanks Coach!!!. Coach Kameel, I am extremely impress with your professionalism while working with me and fitting my bicycle, I enjoy your guidance thru the process, and the time you spend and your patience, I now look forward to your 18 th weeks training to finish with " La Vuelta Puerto Rico" Thank you. As an elite triathlete and running coach I understand the importance of proper fitting on a tribike for injury prevention and energy conservation. Coach Kameel not only has the knowlegde and experience, but also has the proper equipment and tools that give him the expertise in fitting cyclists. He took care of the most mininute detail of my fitting and even served me a cup of coffee. After 6 months of nagging cycling related knee pain I approached Coach Kameel on recommendation from a friend. The pain in my knees was causing me to have to dial back my workouts and my fumbling attempts to adjust my bike fit only heightened my pain. I had avoided a â€œproper bike fitâ€ during my first two years of cycling and all I had to show for the money I saved was poor performance, pain and some miserable rides. Hi Coach Kameel I really enjoyed the fit on the bike. I did a short ride 7 miles yesterday, and felt a huge difference, I had way more power even in the wind, no tension in my body and felt much more relaxed on my bike. I am really looking to a longer ride and working on my weak areas. Amazing beyond anything I thought it would be. Rides so comfortable now it just perfect !!!! Coach Kameel I am really enjoying the new fit. The bike has become really comfortable and I am enjoying spending time on the hoods and down in the drops instead of the bars. The new seat position did take about 6 hours to get used to but I am through that thankfully. Coach Kameel,Everything is GREAT. I'm loving my new bike and feel VERY comfortable on long rides. Completed 30 miles this past weekend and will be doing 40 this Saturday. Thank you so much for fitting me so well. I never knew I could be this comfortable .... I guess I've just always dealt with it!!! Hey Coach Kameel,I want to say thanks again for helping me with the fit. I got out for a couple of hours this morning and the position feels really good. I didnâ€™t think it was possible for the aero position to feel this comfortable and I know it will get even better with time. Thanks for all your help. Riding a bike that is poorly fitted to your body might be one of the worst things you can do to yourself. I felt uncomfortable and overspent after long bike rides, and would dread biking. I decided to get my bike properly fitted, and it made such a huge difference. I recently had a professional bike fit by Coach Kameel and I came away thoroughly impressed and loving my bike even more. Although I had the bike for a year and put over 3,000 miles on it with no problems I always wondered if it was properly set up for me. It turns out it was not. Coach Kameelâ€™s adjustments improved my power output, my comfort on the bike and even made my breathing easier. I met Coach Kameel after conducting an Internet search for Florida bike fitters. I can say that Iâ€™m happy to have met him. Coach Kameel was great from the first email contact up to my final fitting on the bike. Want to save money? Coach Kameel's bike fit did it! His bike fitting session saved me $1,000+, as my old bike feels like new after all adjustment for a good bike fit were made. I learned that I need a good bike fit, not a new bike. So, my alleged entry level bike got a second chance to shine. want to thank you again for the fit and the extra comfort you provide with knowing what you're doing. As riders we depend on a lot of outside knowledge and help mechanically. You have it. You will see me again and you will get many referrals from me.